I'm not a big Facebook person. I have 108 friends. They're all either old school chums that have friended me out of nostalgia, a few current actual friends and coworkers, friends and family of my wife and for the last few months, a growing number of Traditional Catholics that I talk Catholicism with. Recently I have linked to my new "political" blog, and I sometimes get one or two "likes" or generic comments, but in general no one argues or argues politics. A few days ago an old friend from Cambridge--a senior citizen mother (who is a lefty) of a school chum--got into a brief argument about violence vs. pacifism with a new Catholic virtual friend (who I presume is a righty). My lefty friend graciously ended the brief exchange by saying that "debate was good." And then I stepped in to say I valued them both. That was the end of that. A few months ago, Andy Action-Markham asked to "friend" me. He was a gamer guy that I knew from Google Plus and his name was familiar to me because his avatar often graced discussions linked to my gaming blog and/or about the game I published. So I accepted his "friend" invitation. Fast forward a few weeks or months. 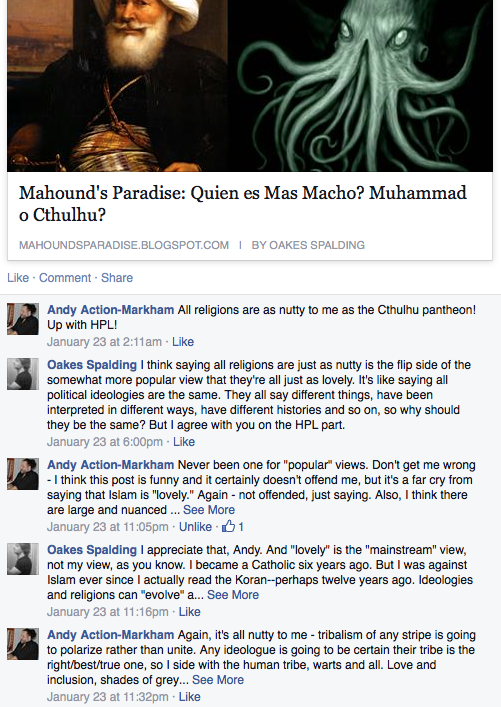 In that time Andy and I had had a few exchanges about gaming, and he'd also written a few neutral or favorable comments on Google Plus and Blogger about by new "political" blog, Mahound's Paradise, that I had started in the wake of the Charlie Hebdo attacks. 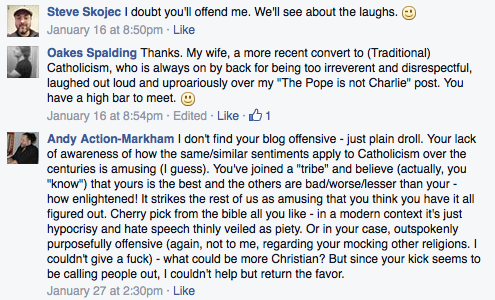 The blog is anti-Islam (as should be obvious from the name) but it also has a focus on discussing Jewish and Catholic issues. Anytime you criticize Islam you're going to get people calling you a "racist", "bigot" and worse, but Andy seemed to have no problem with that. Fast forward a week. It's 3 AM and I'm randomly looking at my Facebook feed in a bored way. Indeed, scanning Facebook had always been for me a pretty intermittent and rare occurrence--something to do when bored. I might find some random thing and write a goofy comment to some school chum I hadn't seen in thirty-five years, or "like" a picture of a baby from my in-laws, etc. Though I cannot completely support the politics, George Takei is a fellow runner and a good man. Long live Captain Sulu! Was this the high-point of Spalding's wit, charm and precise prose? Of course not. It was a silly 3 AM Facebook comment. I went to sleep. I woke up a few hours later and, because I stress about these things, I started to think that perhaps I shouldn't have written that comment. After all, the post seemed to be one of those Facebook moments where everyone celebrates a particular thing together. And even though I intended my post to be friendly, the "though I cannot completely support the politics" part might have annoyed some people. It's Andy's thing (or his friends' thing) and who am I to intrude into it? (Though I wasn't sure Andy or anyone else would really care.) 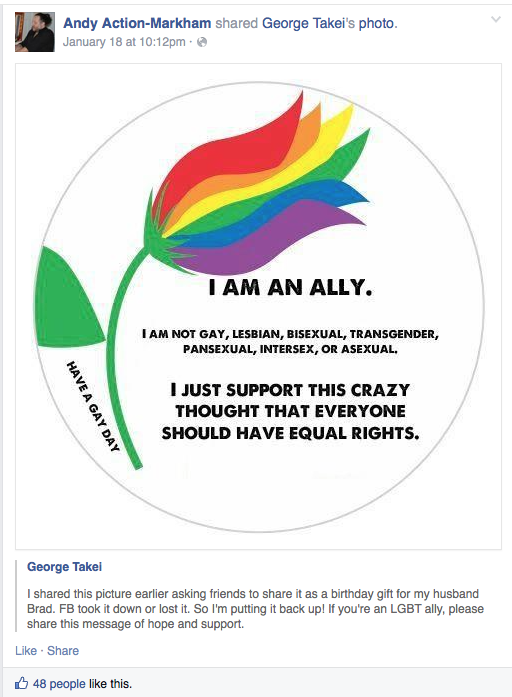 It's not about me and my friendship with a gay runner who knew Takei or my love of Star Trek or whatever. It's about a bunch of people getting enjoyment out of mutually supporting some cause--in this case gay-marriage and related issues--together. Andy Action-Markham is nothing but a psychotic liar. Regarding the initial message, Andy has implied that I started "it" by making some sort of trollish "God Hates Fags" drive-by on his Facebook page that I then deleted to cover my tracks or whatever. That's a lie as well, although obviously I can't prove it since I deleted it. But if I had said something even remotely resembling that, why would Andy have behaved the way he did after I messaged him? 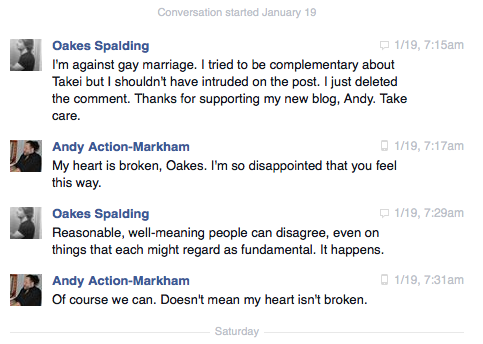 "My heart is broken Oakes, but of course we can still be friends" (followed by additional cordial conversations). Now, of course I am against gay-marriage. But for various reasons (some obvious, some not) I have chosen not to make an issue of it on social media. I know some of my Catholic friends would say that's cowardly. Perhaps it is. Let's pause here. If simply knowing that Oakes Spalding is against gay marriage makes you feel that Spalding is therefore a "spewer of hate", or a "gay-hater" or a "homophobe", if, in other words, you feel that opposing gay marriage is only one step away from "God hates fags", if you believe that anyone opposed to gay marriage, even if never publicly expressing that opinion, should be, among other things blacklisted from the RPG industry, then I want you to stop reading right now. "Uncircle me" or whatever and go away. I don't want your friendship, association or business. I think you are nothing but an intolerant almost certainly anti-Christian, bigoted slime ball. Is that because I disagree with you on the gay-marriage issue? No. Actually, it's almost the opposite. It's because you can't tolerate disagreement on it. If you can tolerate disagreement on it, then in this context I couldn't care less whether you agree with me or not on the issue. Now that we've gotten that out of the way, let's continue. Back to Andy for a moment. Along with the homophobe thing he's now hitting on the Islamophobe thing. I spew hate against Muslims because I'm a racist bigot, etc., etc. Okay, what's the most offensive thing one might imagine an Islamophobe saying? How about comparing Mohammad--the founder of that lovely religion--with Cthulhu--that hundred-meter tall alien monster, and implicitly (so it might be argued) comparing Muslims with Cthulhu Mythos cultists? Yes I did that. Pretty potentially offensive right? The "like" is from me. I'm that kind of guy. Now, actually, I don't think Andy is any particular friend of Islam, or has any real problem with people who don't like it. That's because, as some sort of agnostic or atheist, Andy prides himself on hating all religions. So the new "let's ban Spalding because he's an Islamophobe" thing is nothing but a pose. 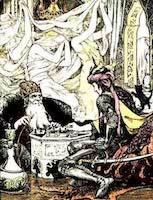 (Again, see above.) But as we'll see in a moment and as can be somewhat seen above, Andy hates Christians so much that if you don't like Islam and you are a Christian, that crosses the line. Or maybe it's just if you are a Christian. The story is almost over. In the next week or so I made some more links to my blog on Facebook and Google Plus. Andy and I had no private or public exchanges. I made no comments about gay issues. And my blog was just as "Islamophobic" as always, though more than half the posts were about free-speech, the new anti-Semitism in Europe or wonky Traditionalist Catholic issues that no one outside that circle would probably care about either way. Note the contrast between my sensitivity in "intruding" on Andy's page by making an overall friendly and complimentary comment about George Takei (and then deleting it out of the same sensitivity) with Andy's insistence to "get in my face" whenever I put something up on my page. And of course, he was the only "outsider" among my "friends", but he had to pre-empt every other post to my friends with some snark on me, other Christians (at least half of my "friends") or Christianity. So, Andy wrote three more snarky comments on Facebook and Google Plus. I left the one up on Google Plus because the vibe there is different. But the Facebook ones were annoying and (I found out later) were irritating my Catholic friends. 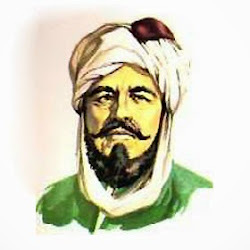 So, what is your end goal with your current "hate Islam all the time" blog? Muslims should convert? Muslims should die? Muslims should come to their senses? Just want us all to know that you really, really hate Islam? We get it - you just don't like them. So what? I'm against gay marriage. I tried to be complementary about Takei but I shouldn't have intruded on the post. I just deleted the comment. Thanks for supporting my new blog, Andy. Take care. At that point it became clear to me that Andy Action-Markham was dishonest, spiteful, and a sort of borderline psychotic. I had no idea how serious he was or how many people he knew in the RPG industry. But given current trends in the industry, I took the threat seriously and realized that it could have harmful results. So, I decided to (in the words of our current Pope) punch Andy back. Andy never publicly said any of the bad stuff (that I'm a racist hate-monger who should be shunned in the RPG community) until I silently "unfriended" him on Facebook (and then responded to his frantic and more and more angry messages by curtly calling his behavior obnoxious). But perhaps he felt that way all along and was simply lying about wanting to remain friends despite our differences and laughing along with me about Mohammad being compared to Cthulhu, etc. Maybe it was all an insincere ploy to gather "evidence", as it were, on my awfulness, to later present to the RPG tribunal, or whatever. Though, in that case, it's odd that he would so strongly feel that he had a "right" to be on my Facebook page--the lone spy, as it were among my school chums and Catholic friends. That's my side of the love story. And that's all about Andy (well almost all). Tomorrow we'll talk about free-speech, tolerance and hate, in general, and the curious inconsistencies regarding these that many (though by no means all) on the political "left" seem to have. As someone who disagrees with you on much of your philosophical and political outlook (I'm an atheist and voluntaryist/anarcho-capitalist), I really can't see where you've been anything other than discreet and tactful here. Even if his accusations were 100% true, it strikes me as obsessive and deranged to embark on a personal crusade against you over it, so I'm pretty sure his own claim to the "hateful" label is very much the stronger. Anyway, hoping the drama fades away quickly, and looking forward to the resumption of your gaming content, which I very much enjoy. Reality is when it happens to you. Thanks for your comment, Eric. I really appreciate it. I scrubbed my last comment (I can do that since It's my blog :) ) as it didn't get my views quite right. I should have said I used to be an anarcho-capitalist but now I'm merely sympathetic. If that makes sense.